The name NEWCASTLE POTTERY is printed in black within the decoration on the jug. This rare mark appears as the mark on early 19th century pieces and refers to the pottery at Skinnerburn. A directory of 1801 lists Addison, Falconer & Co., Newcastle Pottery, Skinnerburn, and it is presumed that this is the maker's name. French Liberty British Slavery by James Gillray 1792. The pottery used only the right half of this print for the jug. Gillray's satire contrasts FRENCH LIBERTY with BRITISH SLAVERY which demonstrates the fine manners of an English city gentleman, his bedroom slippers slashed to relieve the gout and with the table cloth tied around his neck to counter any slight mischance when dining. The Sailors Farewell: "Sweet Oh! Sweet is that sensation, Where two hearts in union meet, But the Pain of Separation, Mingles bitter with the Sweet." This print is found on one side of the jug. 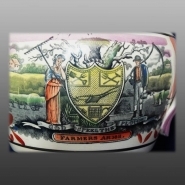 This Farmers Arms print is found on one side of the jug. Maker: Addison Falconer & Co.
A large earthenware jug printed in black underglaze and enameled overglaze using several colors and luster. 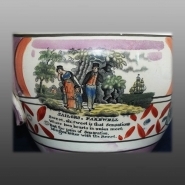 The maker featured half of the satirical print titled FRENCH LIBERTY BRITISH SLAVERY (positioned under the spout) and used two other well known images of the time which are also included below. By the end of 1792 the general change of the British attitude to the French Revolutionaries from initial sympathy for their declared egalitarian aims to mounting revulsion at their excesses were typified in a Gillray satire of December 21st, 1792 (see the source print below). This print was used by at least three pottery manufacturers. Also featured on the jug is a protest against taxes printed in script to the right of the English gentleman. It states "Ah! This cursed Ministry, they’ll ruin us with their Dam’d Taxes! Why zounds, they’re making slaves of us all and starving us to death."